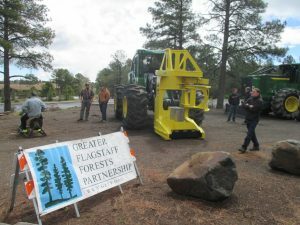 The Greater Flagstaff Forests Partnership (GFFP) held its first “Forest Restoration and Harvesting Methods/ WildfirePreparedness Open House” last spring. The Open House provided an opportunity for the community to experientially learn about forest restoration operations that will occur locally in the months and years to come. This event was held in conjunction with National Wildfire Community Preparedness Day. While preparing for next year’s Open House, a reflection on the pilot event’s accomplishments will augment the success of the event that GFFP is planning for this upcoming spring. 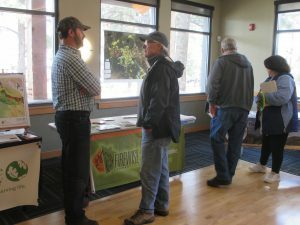 During the Open House, exhibitors explained the measures that are taken by professionals to reduce the risk of severe wildfires and to protect Flagstaff’s surrounding communities and forests. Professionals also shared updates on local wildfire prevention efforts and explained what home and landowners can do around their properties to increase their preparedness and make their properties Firewise. 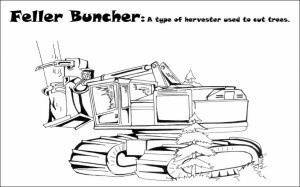 GFFP used two of its resources designed to promote fire adapted communities efforts, a set of Harvesting Methods Fact Sheets and a Poster Display, to explain less conventional harvesting methods, including cable, helicopter and steep slope equipment logging. GFFP also distributed Flagstaff Watershed Protection Project’s recently developed outreach document, “Best Management Practices Used to Minimize Impacts to Soils, Water Resources and Trails,” which focuses on how to mitigate forest management activities’ impacts on natural resources and recreational opportunities. A diverse set of forestry practitioners, fire managers and scientists discussed current and planned harvesting operations; see the bottom of this post for a list of these partners. GFFP’s partners showcased their harvesting and firefighting equipment and offered kids and families the opportunity to explore these novelties first-hand. 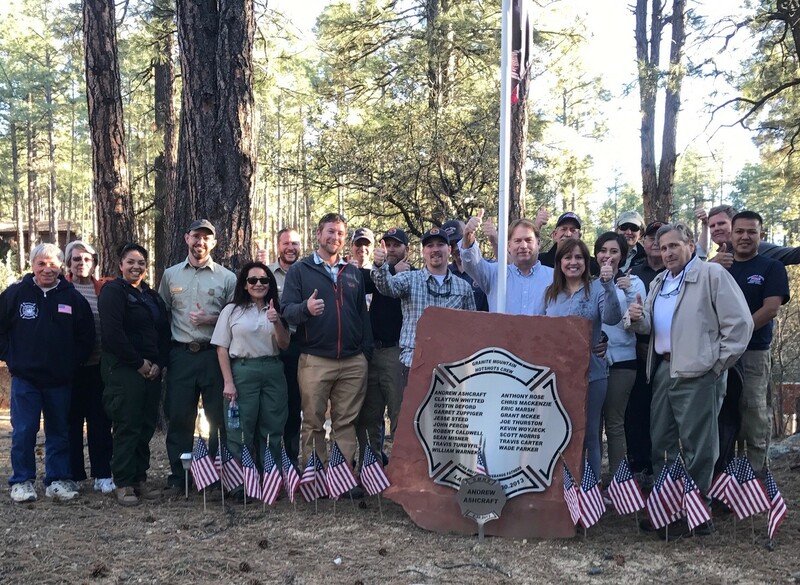 Community members took photos with Smokey Bear and Northern Arizona University’s (NAU’s) Louie the Lumberjack, two very popular woods-workers among local youth. Other stations included: NAU’s Timber Sports demonstrations, forest treatment videos, a kids corner and refreshments. Smokey Bear and NAU’s Louie the Lumberjack even had a friendly crosscut saw competition – Louie won by one stroke. In planning for the event next spring (2017), GFFP will stage the event at a new venue, Fort Tuthill County Park. It expects that cost-share thinning operations will be occurring at the time, which will provide the opportunity for first-hand field demonstrations. The park also recently installed another GFFP product designed to promote fire adapted communities, a forest treatment effectiveness kiosk, which showcases an adapted design of a GFFP newspaper insert. The kiosk highlights recent on the ground treatments that have assisted in containing uncharacteristic crown fires. GFFP can’t think of a more fitting location for its second Open House. Many GFFP partners who attended the event also participated in the planning committee. In the end, the planning committee, exhibitors and the public gained an understanding and appreciation for the cooperative spirit of Flagstaff’s forest stewardship community. 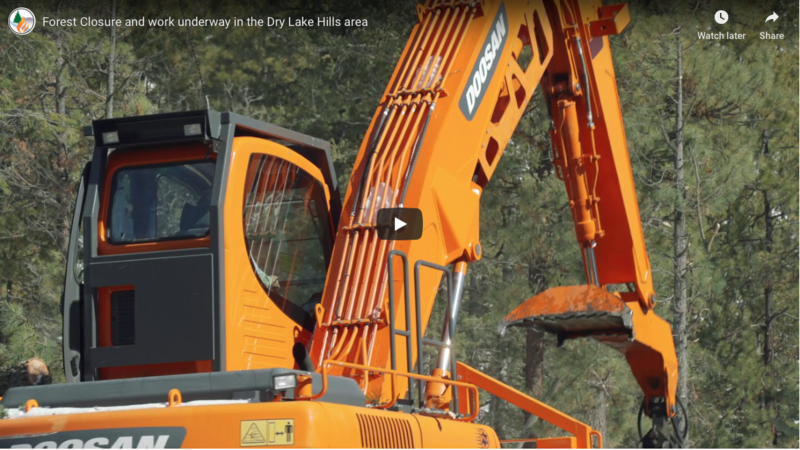 The event was so successful that it was highlighted in several publications including, Cityscape, RDO Equipment Company’s Newsletter, Coconino County’s Report to Citizens and the Four Forest Restoration Initiative’s Newsletter. • Logging operators and equipment companies – the public rarely has the opportunity to interact with these professionals.